Tap, tap, tap! Our dive guide was rapping on his tank with such enthusiasm that I knew he had found something truly special. I had been searching in the muck for over an hour in hopes of finding octopus, but so far, had come up empty. As I swam over to where he was hovering, you could see the broad smile on his face as he pointed to his slate. Two words were all that was needed for me to know that he had located the holy grail of cephalopods: "blue ring!" 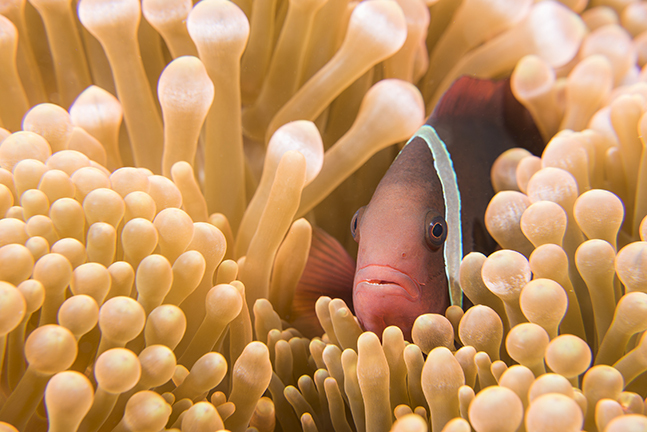 Female tomato anemonefish hiding in a bubble-tip anemone. Photo by Matthew Meier. I had never seen a blue-ringed octopus before, and as I tried to control my excitement and ready my camera, the guide pointed with his reef stick at a lump in the sand. The octopus blended so well with the substrate that I was certain I would have never found it on my own, and probably had unknowingly swum over it several times. Plus, it was tiny—only two to three inches in length—posing the question: How does such a small creature pack such a lethal punch? As I got down to its level and came in close with the camera, it flashed a warning of its famous blue rings. Now it was easy to spot and even more magical to see in person. 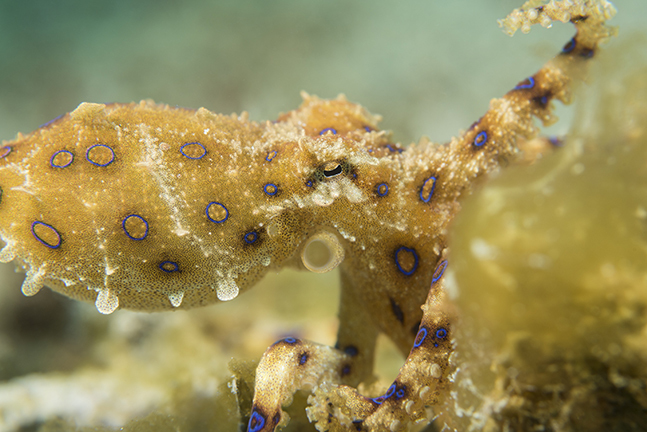 With finding and photographing one of the critters on my bucket list, I already considered this trip a huge success, but the blue-ringed octopus was just the tip of the iceberg of all the cool creatures I would see this week. The island of Bohol is the tenth largest in the Philippines and is located in the Visayan region of the country. The local residents primarily support themselves through agricultural rice farming, though similar to the rest of the Philippines, there is an increase in jobs in the service and tourism industries. The town of Anda is situated in the southeastern corner of the island, surrounded by tropical forest. Resorts in this area are off the beaten path and provide a tranquil, laid back environment. Guests can fly into Manila or Cebu and transfer down to the town of Tagbilaran on the island’s western shore, by either local flight or ferry. From there, the beautiful two-hour drive across Bohol passes through terraced rice fields and small villages along the southern coastal road. Our driver met us with a private vehicle at the ferry terminal, along with our dive guide, who joined us for the ride to get acquainted. I spent the time admiring the scenery while discussing potential photo subjects and lens choices with someone who had over 10 years of guiding and critter-finding experience in the Philippines. It proved to be an invaluable conversation and a much-appreciated personal touch at the start of our week of diving together. Those familiar with the island of Bohol most likely know it for Cabilao or Panglao off its western edge. The Anda area is somewhat new to the diving community, with most resorts having been open for less than five years. The reefs in the area are pristine and several resorts, in coordination with local fishermen, have started establishing small marine reserves to help keep them healthy and well-stocked with fish. 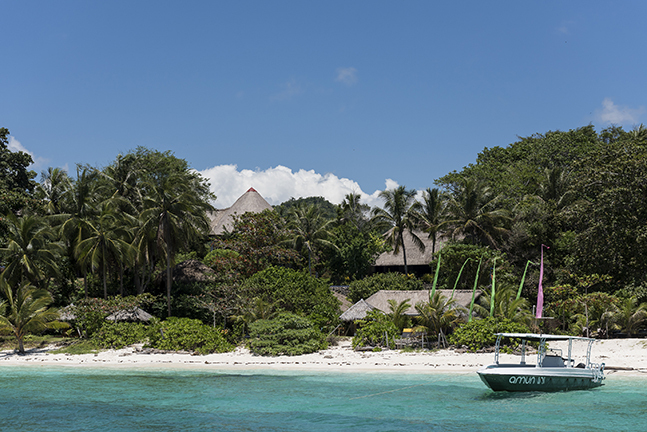 Amun Ini resort has even been working with local researchers on a coral restoration project in the reserve on their house reef. 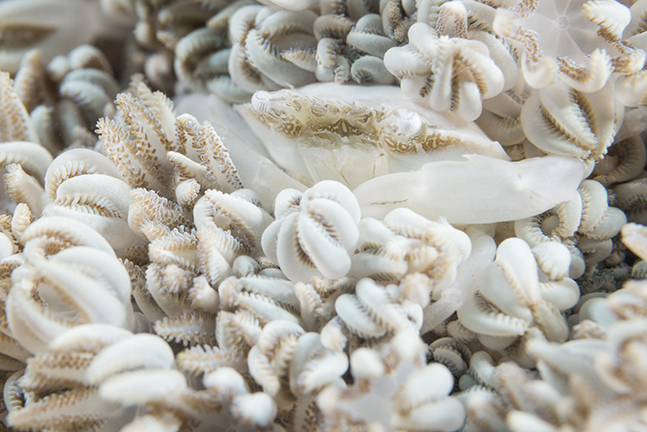 The researchers collect pieces of broken coral and use an epoxy to “glue” the corals back in place. By increasing the volume of coral, the hope is that invertebrate and fish life will grow as well. 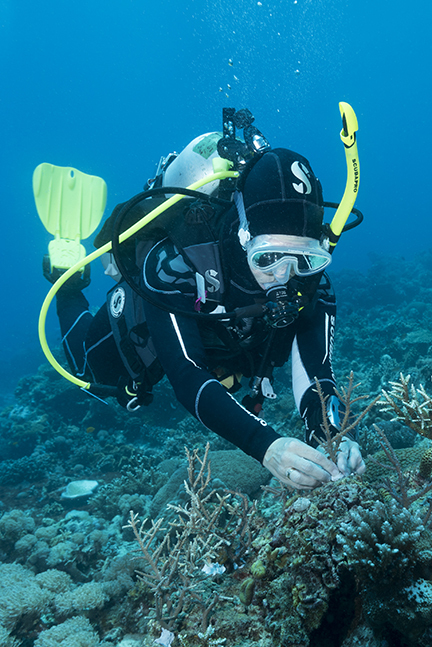 The resort offers guests the unique opportunity to participate in the project by helping researchers reattach broken branches of coral back onto the reef. 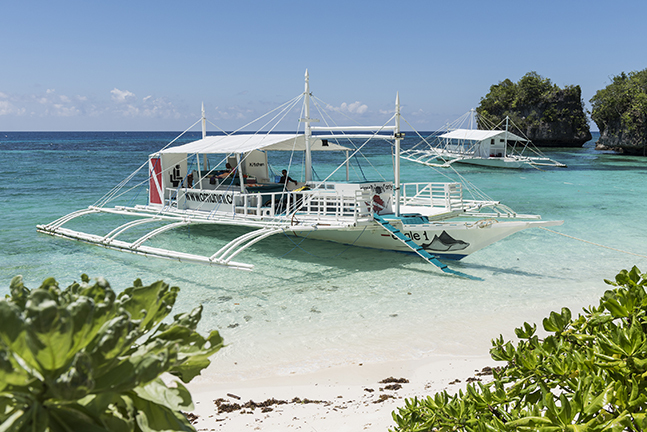 Diving in the Philippines is typically done off an outrigger boat called a “banca”—a narrow-hulled vessel supported by large wooden stabilizers on either side. Often a platform is built over the center hull to accommodate additional passengers and gear. The engines on these larger crafts reside inside the center hull and frequently consist of old truck motors that have been modified so that the drive shaft now turns a propeller. Divers enter the water with a giant stride or back roll off the bow and exit via stairs that are lowered on either side of the platform. Depending on group size, some resorts also have smaller banca boats for four to six divers, or a speedboat for faster transport. Most dive sites in the Anda area are within two to10 minutes of the resorts, and the house reefs straight offshore are well worth exploring. There will be plenty of time underwater, as four to five dives a day is the norm, including an optional night dive or dusk dive to try and witness mating mandarinfish. The water was warm and clear during my visit in mid-September, with occasional light currents. I wore a 3mm full wetsuit to protect against stings and scrapes but did not necessarily need it for warmth. The calm dive conditions make the area perfect for divers of all skill levels, providing they have enough buoyancy control to stay off the reef. 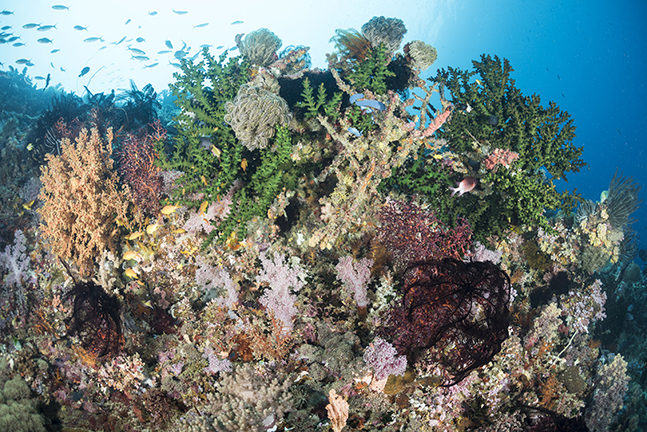 The diving diversity in the area is impressive both in terms of topography and coral assortment, as well as in species density and variety. Expansive hard coral gardens start in the shallow waters just offshore, and they are fun to explore whether utilizing a snorkel or a scuba tank. Beginning at 20 to 30 feet, the gardens transition to vertical walls, which are covered in sponges, sea fans, schools of reef fish and bommies of both hard and soft corals. 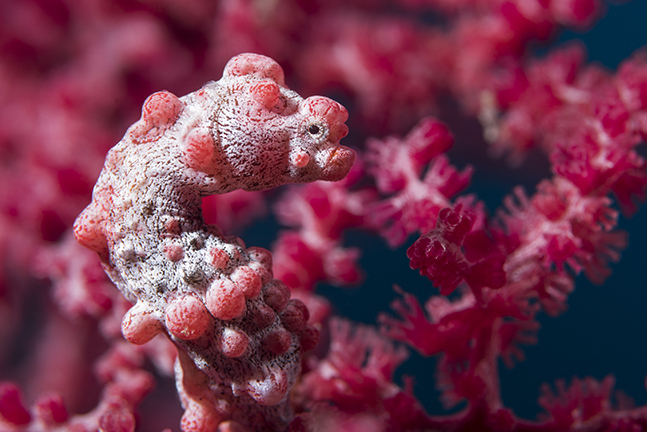 The wide range of life on the reef provides a multitude of photographic opportunities. On several occasions, I repeated a dive site named Coral Gardens because the spot had so much to offer and each journey along the reef proved unique. 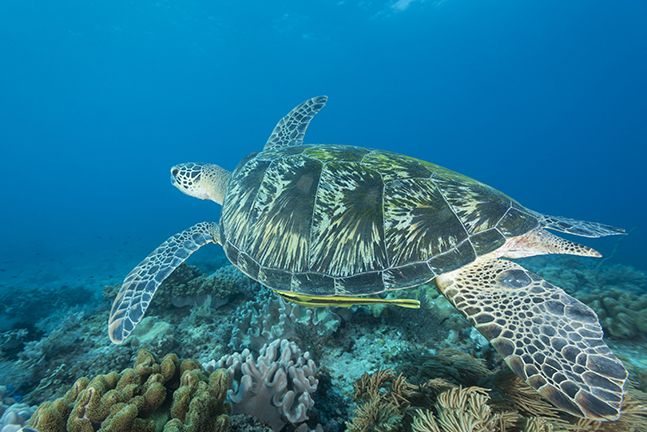 As an added bonus, at the end of each dive, we were treated to nearly a dozen green sea turtles lounging among the shallow corals. On some of the dives, I set up my camera for super-macro to capture anemone shrimp and pigmy seahorses, while on others, I used a fisheye lens to photograph sea fans, coral-scapes and of course the turtles. Anda also has large sandy areas with fantastic critter (muck) diving. The substrate is light in color, which provides a nice contrast for some inhabitants while making others harder to locate and photograph. This is where we found the blue-ringed octopus, and where mimic, wonderpus and coconut octopus have also been seen, in addition to a wide assortment of frogfish at different times of the year. A few of the species I saw living along the sandy bottom included flying gurnard fish, longhorn cowfish, devil scorpionfish, dragon sea moths, mantis shrimp and Napoleon snake eels. Any foreign object sticking out of the sand, be it plant, animal or debris, soon becomes its own ecosystem, complete with critters that have adapted to blend in and/or imitate their host. 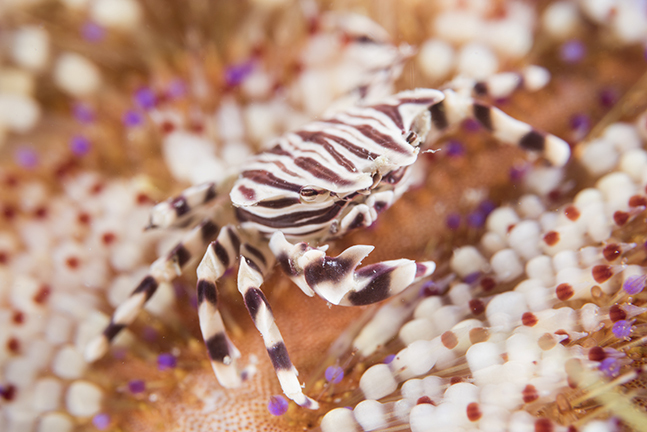 Some of the characters that I photographed in this category included the sea cucumber crab, dragon shrimp, Xenia soft coral crab, wire coral crab, Coleman shrimp and zebra crab. To find these photographic gems, it is important to know—or perhaps equally as importantly, to have a guide that knows—the environments in which they live. Otherwise, these animals are too well camouflaged and frequently too small to find simply by casually scanning the sea floor. When a surface interval is required there are white sand beaches to explore or lounge chairs next to the pool, if sunbathing is more to your liking. Perhaps you prefer to nap in a hammock suspended from a shade tree, while listening to the waves gently lap against the shoreline. Combine any of the above activities with a world- famous mango smoothie and you have a perfect afternoon. The mangoes in the Philippines are incredibly sweet and tasty. Perfect for a snack, a beverage or dipped in chocolate for dessert. Dried mangoes can even be brought home as gifts or for your own enjoyment while prolonging the holiday experience. Spa services are available if you feel the need to rejuvenate or get a massage. For those that do not want to leave the water, possible surface activities include snorkeling, kayaking and paddle boarding. Resorts can arrange nearby biking and hiking trips or even a riverboat cruise, as well as a visit into town for some local culture. My personal favorite involved a recliner on the beach, watching the night sky, as giant fruit bats flew overhead in silhouette. With a wingspan of up to four feet, the bats are impressive sights, and the stars shine incredibly bright in this remote corner of the globe. Sadly, all journeys must come to an end. When it is time to head home, I recommend taking a scenic tour across the islands interior to view the Chocolate Hills and the endemic Philippines tarsier. Chocolate Hills. The Chocolate Hills are a National Geological Monument consisting of over 1,268 limestone and basalt domes ranging in height from 30 to 120m (98 to 390ft). The domes are covered only in grass, unlike the surrounding jungle, and the grass turns brown in the dry season, giving them the appearance of rows of chocolate kisses for which they are named. The hills are spread out over 50 sq km (20 sq mi) and can be viewed from several vantage points. Our climb up the stairs to the observation deck was well worth the effort, as this topography can only be seen a few places on earth. Philippines tarsier sanctuary. Nearby to our Chocolate Hills overlook was a sanctuary for the Philippines tarsier, one of the world’s smallest primates. These nocturnal creatures are carnivorous and have huge eyes for hunting at night. During the day, they rest in the shade, holding onto branches with suction cup like fingers and toes. Full-grown, the tarsier is no bigger than a man’s fist and they are difficult to find in the foliage. Docents watch over each animal, making sure guests do not hassle them with selfie sticks or flash photography. The sanctuary was established to help protect and preserve the tarsiers whose natural habitat is being lost to development and deforestation. The Anda area of Bohol is a dive destination to which I hope to return again and again. 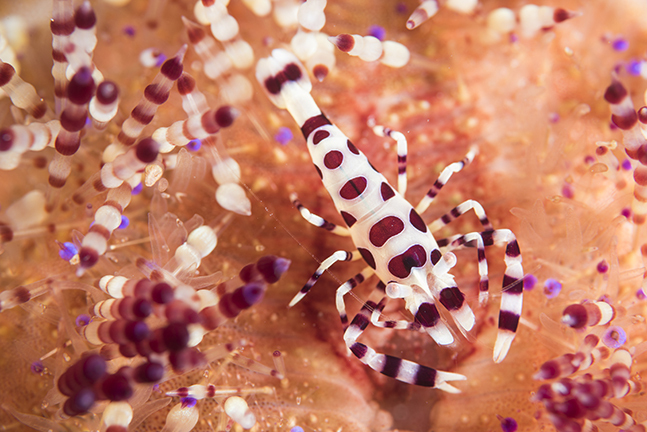 Nowhere else in the Philippines have I found such variety in the underwater landscape and critter concentration, all just steps off the beach. I thoroughly enjoyed the diving, the remote seclusion, the first-rate service and relaxing atmosphere, as well as the endlessly friendly Filipino hospitality. If you are contemplating a trip to the Philippines, the Anda area deserves serious consideration. I think you will be glad you made the trip. The author would like to thank Amun Ini Beach Resort and Spa (amunini.com) for their incredible generosity as the gracious host on this adventure; Magic Oceans Dive Resort (magicoceans.online) for hosting a lovely dinner and resort tour; Philippines Tourism (experiencephilippines.org) and EVA Air (evaair.com) for their assistance with transportation and flights; and lastly, Scubapro (scubapro.com) and Blue Abyss Photo (blueabyssphoto.com) for their assistance with underwater dive and photo gear.